Chevrolet showed dealers and employees a hatchback version of the upcoming all-new 2016 Cruze alongside the updated 2016 Chevy Silverado during its recent national dealer meeting in Las Vegas. According to dealers, the 2016 Cruze hatchback will go on sale at the same time as the sedan in the Untied States, finally answering the calls of enthusiasts to offer the Cruze hatchback variant in North America. 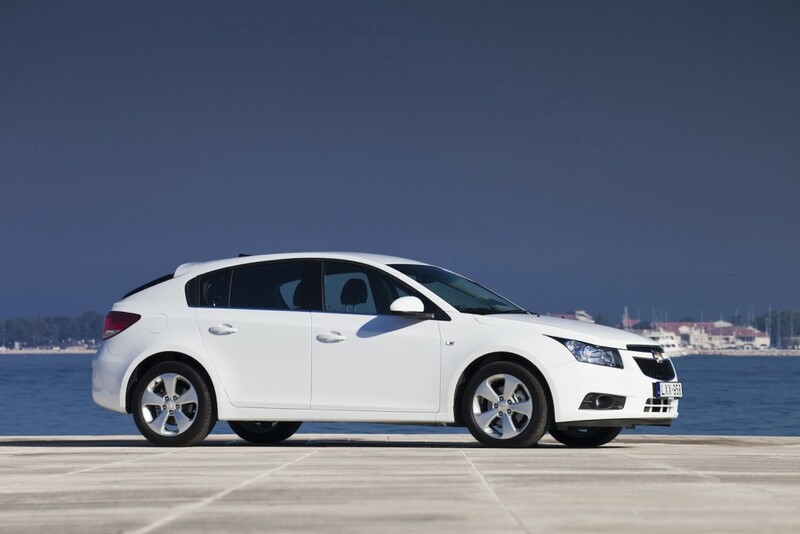 Pictured above is a show car version of the current Cruze hatchback for sale all over the rest of the world. GM will unveil the 2016 Chevrolet Cruze (and the 2016 Camaro Convertible) this Wednesday, June 24th, 2015. The compact vehicle range will be completely overhauled (redesigned and re-engineered), ride on GM’s new D2XX platform to enable notable weight savings over the outgoing model, feature an all-new engine lineup, a plethora of new in-vehicle technology, and a host of other new features. It will also be different from the Chinese-market Cruze. Our only question is how The General has managed to hide the Cruze hatch from prying spy photogs for so long. Stay tuned as we bring you continuos coverage of the all-new 2016 Cruze, along with Chevrolet news, right here at GM Authority. YES! I can’t wait to buy the hatchback premier version. I’m really excited! Let’s hope that they price it right too! That’s a good alternative to the Focus hatch. Glad they did this. Like Elroy says, they need to get the price right. It’s about time! What were they waiting for? Well I see two folks here that appear to be willing to buy. Will you buy one Harvey and Cameron? I hope it does well but with the advent of the CUV and the hot increasing sales of a CUV it may prove to be a challenge to sell a hatch in the American market. Don’t get me wrong as I am a proud owner of a HHR SS and love the performance driving and the utility but I am often in the minority vs. the market anymore. I see this as low risk as it will be overseas too so GM is smart to do it but I will have to wait and see before I call this a success. So many of the other hatches are fleet sales and not much profit here. Americans love SUV or things that even if car bases represent a truck. The wagon and Hatch both are a challenge to sell here. Have to agree with you. There are a lot more Mazda and Ford sedan versions than their hatch versions on the road. The question is will it be build here in North American or built at the same plants in Europe and shipped? I read elsewhere that the split for the Ford Focus was something like 60-40 sedan to hatch. That’s not bad and well worth making one if they can get close to that good. I hope like scott3 says that the people who champion such will actually perform. I’ve saw the fully uncovered pictures of the sedan and the interior. So far I think it’s a night and day difference from the 2015, and it’s going to be a big hit, for the sedan. Now the hatch might be a little harder like you were saying, but it definitely has its place. I complete agree with what you are saying though. The only reason I would buy a hatch is I can get a good gas mileage car at a nice price with resonible space. Now my personal opinion is a CUV would be a little to big for me as it’s just me. If I had kids to move around then I would get one, but for just me the hatch is the best vehicle. Everyone has different needs so I feel there’s a spot for both cars. If it was showed to the dealers I expect it to be sold here. To be honest if they use much of the structure from overseas the cost will be minimal. Now if only people who have been saying to build it buy. We saw that with the Diesel and they did not put the money were their mouths were. Like those above they cheerlead but will they buy? Wonder how. GM managed to hide the Cruze Hatchback ! Aussie designed, had one in the garage now for over 3 years! Hidden in plain view like the Commodore SS, all the. HSV’s the real , fully loaded Caprice. In my opinion its a bit dumb looking…I think Chevy should import the Opel Astra instead. That’s a hot looking car that, I think, would compete directly with the Ford Focus. where is the Cruze wagon for US, the hatch back looks like it can barely hold 2 full size suitcases… hatchback are all for local driving, Need a proper “cruze” mobile, I can’t stand SUV models, Can somebody bring a proper wagon back to US shore…please. Where is the Mazda 6 wagon, Ford Fusion wagon??? MB & BMW are way overpriced!